Dan Moore, a Lincoln Lion for life, contacted PlayBall! regarding this photo from his family archive. According to Dan’s sister Chris, it’s a photo of their father James A. Moore, Jr. taken in their grandmother’s backyard at 821 Haight Street. Dan and sis are wondering if any of our readers recognize the uniform that dad is wearing. 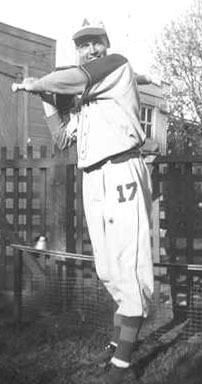 We know that Mr. Moore played baseball for Alameda High School (Class of 1944). Noting the large “A” on his cap I’d venture to guess that the photo was taken during his high school playing days. After graduation, James Moore continued to play on the local sandlots, even after marrying the lovely and beguiling Mrs. Moore. It’s a wonder they had kids. “Gotta run, dear. Doubleheader today!” If you have any clues about the photo (what team? baseball or softball? league? ), please let us know. UPDATE: It didn’t take long to find an answer. 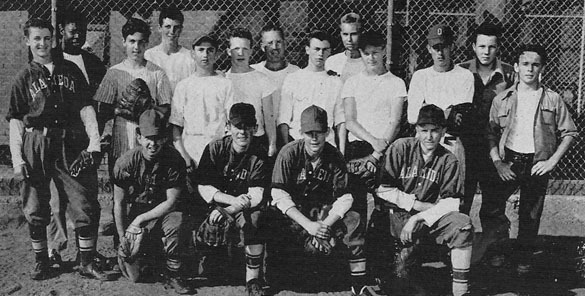 Dan and Chris, it appears that this photo is of your dad in his Alameda High School varsity baseball uniform. A member of our dedicated PlayBall! research staff, none other than my dad, Herb, checked a 1943 AHS yearbook. Sure enough, those are the uniforms sported by the sandlot Hornets back in the day. I’m assuming that this was taken in 1944 because the yearbook does not name your dad as a member of the 1943 varsity team. He might be on the JV squad pictured below. Ian Riggall, Rittler Wildcat first baseman, attempts to pick-off Franklin baserunner Steve Leitz. The play was close but “The Hawk” managed to scramble back through a cloud of dust and beat the throw. Leitz won this battle but Riggall won the war as Rittler beat the Franlin Eagles 2-1 on this day in late July. Rittler’s Brad Merian was the hero driving in both runs with a base hit in the second stanza, followed by a sacrifice bunt two innings later that enabled Ross Dalby to score from third. Future television spokesperson Scott Sherwood (Don Sherwood’s Golf and Tennis World) collected the win allowing six hits and four free passes, while striking out nine Eagles. Rick Codiga took the loss for cellar dwelling Franklin who chalked up their eighth loss of the 1970 Little Coast League season. 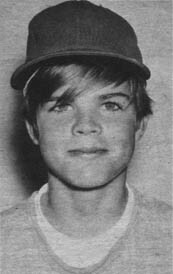 On August 28, 1972 the ARPD named Jeff Hartley as Little Coast Player of the Week. The Longfellow star was clutch in the Tigers run to the league championship. In a must-win game against the Krusi Colts, Hartley’s two-run double in the top of the ninth propelled the Striped Cats to a playoff date against the Washington Pirates. In the biggest game of the season Jeff once again came through in the clutch. His seventh inning single knocked in two big runs that propelled Longfellow to the 1972 Little Coast title. Jeff lived at 523 Buena Vista Avenue. 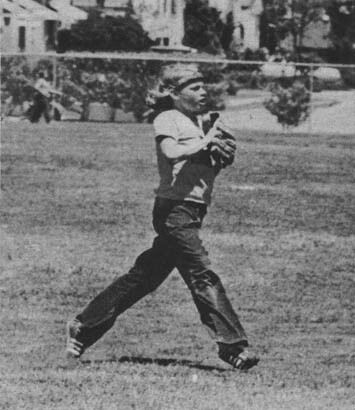 In the summer of 1974, headbands replaced caps for some cool cats like this Woodstock outfielder. Apparently the look worked well as Tobbie Hoyt and his Dolphin teammates beat Mckinley 21-2. 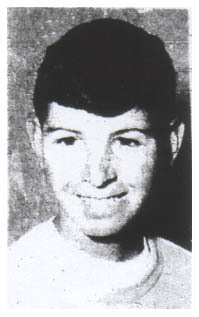 On July 12, 1966, Chuck Sabbatini of the Lincoln Lions was named Little Coast League Player of the Week. Chuck played a key role for the boys of Lincoln in a close game against Franklin. Coming on in relief with one out, “Sabbo” immediately shut down the Eagles bases-loaded threat. The son of Mr. and Mrs. Albert Sabbatini also added two base hits in the Lions 7-4 victory. This was not the first Player of the Week honor for the Sterling Avenue right hander. 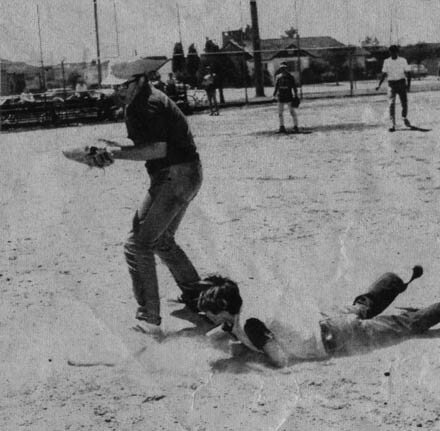 Chuck was a frequent star on the sandlots of Alameda. Today he spends his time looking for errant drives off the tee. 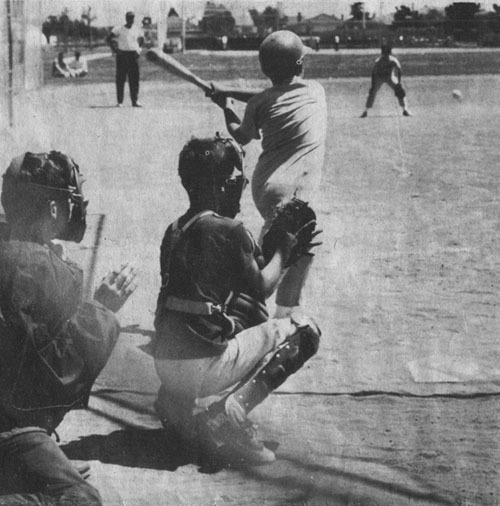 This photo was taken in August of 1966 during an ARPD Pee Wee League playoff game between the Krusi Colts and Rittler Wildcats. Pitcher John Snopkowski shutout the Wildcats 2-0 with his outstanding no-hit, 13 strikeout, 3 walk effort. John also added a bases-loaded single to drive in Don Ratto and John DeLeau for the games only runs. Bob “Rocko” Rhodes and Terry Valenzuela added two base knocks each for Krusi. It should be noted that Rittler pitcher Mike Benesh was no slouch on the mound, surrendering just six hits and two runs in five innings of work. Here is what we don’t know… who’s in the photo? Here is a list of the Alameda Recreation & Park Department Boys Baseball All-Stars from 1969. © Kin Robles and PlayBall! – Alameda’s Sandlot Blog, 2009-2017. Unauthorized use and/or duplication of this material without express and written permission from this blog’s author and/or owner is strictly prohibited. Excerpts and links may be used, provided that full and clear credit is given to Kin Robles and PlayBall! – Alameda’s Sandlot Blog with appropriate and specific direction to the original content.